Menorca 22, 46023 Valencia, Spanje. 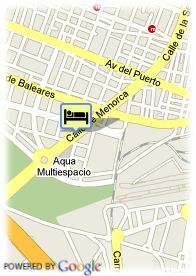 Urbem Valencia Hotel is a modern establishment ideal for the business trips and tourism. Situated next to the City of Arts and Sciences from Valencia, this hotel is located close to the new commercial, financial and cultural city of Turia. Its spectacular interior uses an Avant-garde design, a functional character and the pleasant natural light flooding through all its facilities. The hotel offers 262 large rooms, all exterior and completely equipped. With a practical Conventions Centre, it has 12 meeting rooms, perfect to hold any kind of events, reunions, congresses and seminaries. It is perfectly connected to the harbor, the airport and the city centre. In order to have a rest, nothing is better than to enjoy its private garden, relax in its spa with thermal waters, or practice sports in its complete gym. Design, comfort and quietness. Voor oudere kinderen en volwassenen wordt 120.00 € per extra bed aangerekend.